Kent Crockett illustrates a joyful attitude with the story about a man who walked by a table in a hotel and noticed three men and a dog playing cards. The dog appeared to be winning. “That must be a very smart dog,” the man commented. “When we have joy in our hearts,” Kent commented, “ it will be obvious to everyone!” Indeed the wise man observed, “A joyful heart makes a cheerful face” (Prov. 15:13). The Bible has a good deal to say about God’s people being joyful. Several times in the Psalms, the poet speaks of the joyfulness of God’s people. The joy the Psalmist writes about is found in a close relationship with the Lord. They walk in the way of righteousness. Enjoy the blessings of salvation. And express their joyfulness vocally in praise and in song. Therefore, it is possible regardless of the circumstances of life or the challenges we may face, to fulfill Paul’s command to “be joyful always’ (1 Thess. 5:16). It is interesting, however, that in the next two verses the apostle says, “pray continually,” and “give thanks in all circumstances, for this is God’s will for you in Christ Jesus.” A prayerful spirit coupled with a thankful heart provides the foundation for a joyful attitude. When we acknowledge that all our blessings come from God, rely on his promises of pardon, protection, and spiritual provisions, our hearts will be filled with gratitude. Thus, joyfulness comes naturally. The Bible even says that “a joyful heart is good medicine” (Prov . 17:22). I have talked to many doctors who have observed the healing benefits of a patient who possesses a joyful disposition. 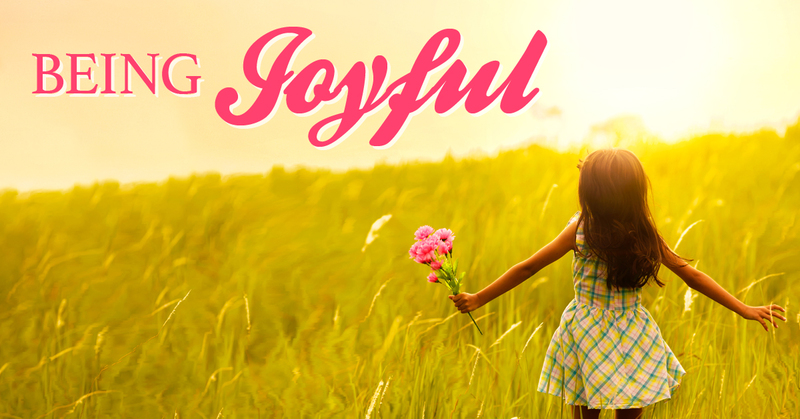 Being joyful is a choice. Tim Hansel expressed it this way, “I cannot choose to be strong, but I can choose to be joyful. And when I am willing to do that, strength will follow.” This was Nehemiah’s observation to the Israelites returning to their homeland and working to rebuilding the walls of Jerusalem.” Do not sorrow, for the joy of the Lord is your strength” (Neh. 8:10). Ultimately, we will experience the joy of the Lord when our hope is heavenward and our sights are firmly fixed on dwelling with God eternally. To “be joyful in hope,” (Rom. 12:13) is not wishful thinking. But is founded on the deep convictions of our faith (Heb. 11:1). Regardless of how bleak the world appears. Or how loudly the naysayers shout. Or how corrupt our culture becomes. Be joyful. And don’t be afraid to make your joy known to those around you. You’re holding the winning hand. Great article. Joy is contagious. One reason among many why Christians should never play poker. A winning hand would also be a losing hand. I don’t know anyone more joyful than you and dear Norma Jean. What a great example you both have been to us.